Yuk datang yah ke acara TelkomcraftIndonesia. Bakal seru disana! 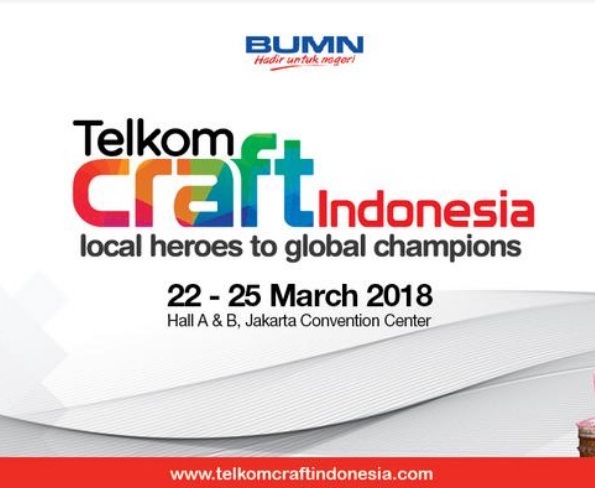 Telkom Craft Indonesia is Telkom’s fulfilment of its role in developing Indonesia’s digital community with the ‘Local Heroes to Global Champions’ spirit on the use of digital technology to promote the best product made by Indonesia’s creative entrepreneurs to the world. The exhibition is also held to support the SOEs Present for the Country (BUMN Hadir untuk Negeri) program, especially in empowering the people’s economy to support the government’s goal in making Indonesia as the largest digital economy country in Southeast Asia.